Published in The Energy Collective (December 27, 2017). Leading stakeholders in electricity system innovation gathered at the Rocky Mountain Institute’s 2017 eLab Summit in Albuquerque, New Mexico. One working group was dedicated to the electrification of heating and cooling in buildings. The Pembina Institute and the City of Vancouver participated in this meeting in order to bring lessons from jurisdictions around the world back to Canada and to contribute to the low-carbon transition that is already well underway. This is Part 2 in a three-part series on electrification in the built environment. Read Part 1 and Part 3. Electrification of heating and cooling in homes and buildings offers many benefits to consumers — and can significantly reduce carbon pollution from the built environment. However, cost and other challenges currently stymie the use of electric technologies such as heat pumps. Utilities have an important role to play in accelerating the adoption of these technologies, and also stand to benefit from the integration of these devices with their systems. Preparing for growth in distributed and connected energy resources, on both the supply and demand side, is part of the transition that utilities must make as they reimagine their business models for the low-carbon future. The case for electrification is becoming more compelling each year. The Canada Green Building Council estimates that even the most carbon-intensive grids in Canada, such as Alberta’s and Saskatchewan’s, will reach a point within the next 10 years where electric heating results in less carbon pollution than high-efficiency natural gas heating. There is also a growing sense of urgency, as cities recognize that every heating system (furnace, water heater, etc.) replacement will need to be a heat pump or other carbon-free solution by around 2030, in order to transition our economy away from fossil fuels and forestall the most catastrophic effects of climate change. In the face of these realities, however, utilities stand to gain greatly from emerging technologies like “grid interactive” heat pump water heaters, and other connected devices that have the potential to transform their business models and help drive a much bigger transformation in the way we produce and use energy. Allowing devices in buildings to communicate with the grid lets utilities better manage the flow of power hour by hour, or even minute by minute. These benefits are often referred to as “arbitrage,” “load shifting,” or “ancillary” services, depending on the time frame over which they work. Like other energy storage solutions (for example, Tesla’s Powerwall), a water heater can act as a kind of battery, taking advantage of renewable energy when it is the cheapest and most abundant and then holding its “charge”, or heat, until it is needed. An existing water heater can even be retrofitted with an inexpensive device that communicates with the utility. This kind of functionality is very useful to utilities that want to integrate more renewable energy into their system but need new ways of smoothing out the intermittency of these resources. 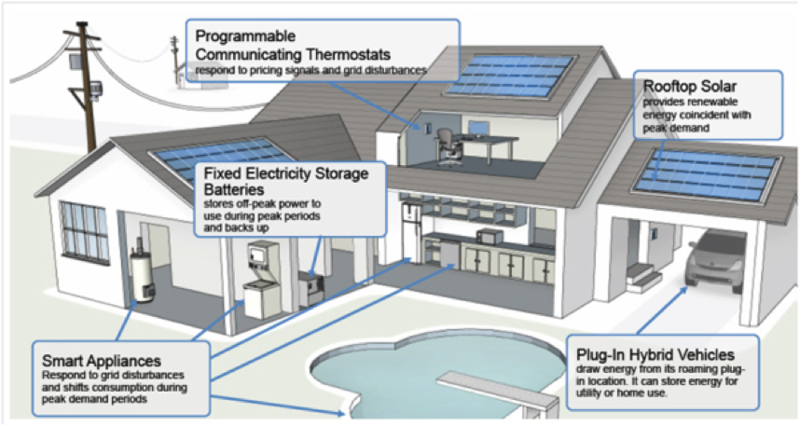 In fact, this “thermal” storage is often the most cost-effective of all energy storage options. There is a benefit for the consumer too. Utilities can implement time-of-use or demand rates that let customers take advantage of cheaper electricity by running their water heaters and other appliances at certain times of the day. Such programs have been running successfully for years in the United States. Advanced demand response is also making its way to Canada — for example, through the PowerShift Atlantic project, which connected thousands of devices with the grid across New Brunswick, Nova Scotia, and Prince Edward Island, creating a “virtual power plant” that helps to support the integration of wind power. Other electric appliances in homes and buildings will need to become “interactive” as well, allowing for devices to respond dynamically to the needs of the grid. A popular example of this is the potential for electric vehicles to become part of a building’s energy infrastructure — providing battery-stored energy to the grid at night when not in use and other resources such as solar are not available, and earning money for the vehicle owner in the process. There is a role for integrated and natural gas utilities in this transformation as well. A low-carbon energy system might include a role for “renewable natural gas” (RNG). Derived from waste products, RNG could become an alternative pathway to lowering emissions, but has so far not been shown to be viable on a large scale. More work should be done to determine the role of these products, especially for buildings that are connected to central or “district” energy systems, and for uses like cooking. When comparing fuel choices, developers and municipalities should take into account the full life-cycle costs of installing or replacing gas distribution pipes as compared to the cost of infrastructure required for electrification. Widespread electrification in all sectors of the economy provides challenges to utilities, both in terms of meeting increased demand for electricity as well as the need to rapidly phase out fossil fuels. However, the technologies that are becoming part of Canada’s low-carbon future also have the potential to respond to some of utilities’ greatest needs, including the ability to support the increased integration of local, distributed, and renewable energy sources. In Part 3, we will discuss the role of governments and suppliers in an electrified building sector. This article originally appeared on The Energy Collective on December 27, 2017. Tags: National, British Columbia, Electricity, Energy Efficiency, Buildings.